See link at bottom of page for specific litters. NOTE: WE DO NOT SHIP! We have a few litters each year, (to see what's available now go to the link at the bottom of this page) and if we can't satisfy your needs we may be able to direct you to responsible breeders who have vizsla puppies available. 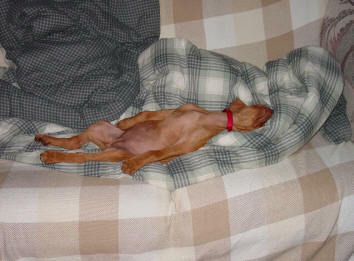 All of our vizslas display a kind and gentle temperament, hunting ability, and trainability before we breed them. We compete with our vizslas before breeding to demonstrate temperament and trainability. Field is our primary interest, but we also show in conformation since we promote the dual vizsla. The males used for breeding can be our own or outside our lines. Puppies are available from our litters as well as "pick of the litter" puppies from others who have used one of our males for a stud dog. We have done our best to make sure your pup is free of genetic defects. We ask that all puppy buyers have their vizsla's hips x-rayed at two years of age and have the vet send the x-ray to the Orthopedic Foundation for Animals for an evaluation and a number. More details on our guarantees will be discussed at the time you decide to purchase a puppy from us. All our dogs are extremely healthy dogs and we've had no major health issues. All hips are either Good or Excellent rated by the OFA. We will happily discuss your doggie needs and try to match you up with bloodlines that are best suited for you and/or your family. Once you commit to purchasing a vizsla from us, we require a $100.00 deposit which is fully refundable if you change your mind at any time for any reason. After the deposit is received, your name goes on the "list" of puppy buyers for that litter. This is the order in which the puppies are reserved, and this is the order in which you will pick your puppy. Our puppy price is included in our pricing letter we send you after your initial inquiry. You may name your vizsla anything you wish. We do not require you to compete with your vizsla but give it love and a good home. We encourage you to come to one of many "fun days" sponsored by the Vizsla Club of Illinois. The club sponsors several fun days a year at which you can experience some of the many things you can do with your vizsla in a competitive manner. If you want to pursue some type of competition, we would be thrilled. We will help you as much as possible. Many competitors started out just wanting a "pet." Then, after getting a taste of field, show, etc., found they liked it and went on to earn AKC titles for their vizsla. A dog's most important job is being a good family pet, so we charge the same for all our dogs and it does not make a difference if you want a competition dog or a great family pet. When you pick up your vizsla puppy you will receive a large notebook full of information. You will get the AKC registration paper, the shot record, information about the Vizsla Club of Illinois, reference materials, five generation pedigree, training tips and articles, excellent training books "Puppy Primer" and "Way to Go" by Patricia McConnell, PhD, and other useful information. You will also get a lifetime commitment from us for help and/or mentoring. If you ever need to re-home your dog for any reason, we are here for you and will take it back. Our pups enjoy playing outside in a safe environment and have many fun things to do. The tunnel is a great confidence builder. They are also in the kennel building at 6 weeks of age where they learn to potty outside which make them very easy to housebreak. They are moved around from inside the house to the kennel building and back in again so they acclimate to new places well. They are also conditioned to a dog crate as much as possible. We will not ship puppies anymore. You will have to come here to pick up your puppy or if you are able to fly into the Chicago-Rockford airport (RFD), we can meet you there and hand-off a pup to you. You will have to check the site for Allegiant Air to see where all they go and if it is possible. It may require a connecting flight with them. Often there is a flight in and then within about 30 minutes it goes right back out to the same place it came from. It is a very small airport and I have been allowed to go through security and wait at the gait. But even without that there is plenty of time to get your pup from me at the airport. We will not drive to any other airport. Shipping had cost new owners $400 in the past, so with plenty of time to book a flight 7 weeks out, you should be able to get a decent fare. We are 1.5 hours from O'Hare, so it will be necessary to rent a vehicle to come here. Starting September we offer a choice of two different soft-sided carriers for the puppy's flight at our wholesale price of $30.00. It would cost over triple that in the pet store. We will also have all the proper documentation you need required by the airlines and provide you with everything you will need for the flight to make it easy for you and the pup. You also get our Puppy Manual with all kinds of information to help you and a lifetime commitment from us as your mentors.